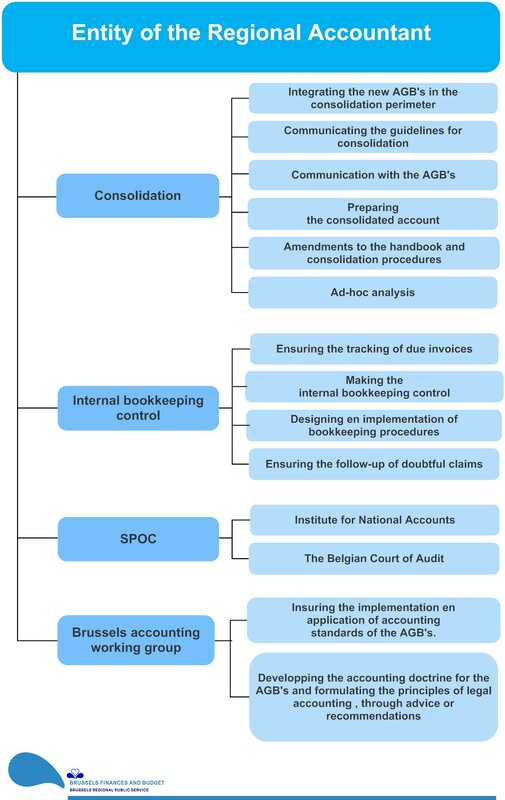 keeping the region's accounts in accordance with legal requirements and submitting the general accounts to the Belgian Court of Audit (these having been created by the Bookkeeping Board). The general Government services account reflects the financial status of the entire Brussels Regional Public Service. creating and validating the bookkeeping systems used to supply or justify bookkeeping information and carrying out bookkeeping audits covering all accountancy procedures, to ensure the accuracy and reliability of records made in the accounts and other bookkeeping documents and to protect the financial position. creating the consolidated accounts of the regional entity. “Consolidated” means that the accounts are composed of the annual accounts of all accounting bodies (AGBs and Brussels Regional Public Service), which together form the regional entity.